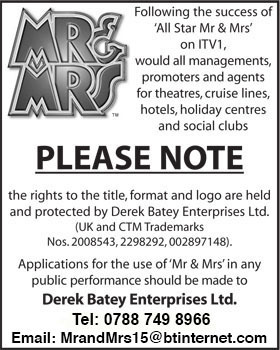 Most of it only applies to companies or organizations looking to run a “Mr & Mrs” live show/cabaret or a series of shows/cabarets for profit, so if you are thinking of doing this you’ll need to obtain a license from Derek Batey Enterprises Ltd. before you go any further. 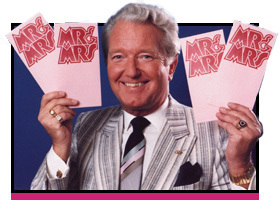 However, if you want to hold a “Mr & Mrs” evening or something similar for charity, then a letter or email to Derek Batey Enteprises Ltd., (via the link on this site), explaining what you would like to do should get you a prompt reply and permission to go ahead for your good cause. If you can include a few details of dates, times, number of shows and, most importantly, a short explanation of what form the evening/event will take and the charity supported, these will help to make it a very quick and easy process to grant permission.